The hosts were really lovely, the location was very convenient, and use of the pool opposite was a great bonus. Wifi was good and reliable in the room too. Very nice people that run the business. Good size of apartment, comfy beds. Apartment has been cleaned a few times while we were there (9 nights). We had larger apartment than expected for no extra money. Good view to the mountains. Very nice, helpful and welcoming owners. Great Location, not even a 5 min walk to the nice sandy beach of stalida. Great value for the money! Stella and George are very nice hosts, kind and helpful. 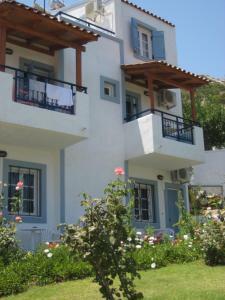 Apartments are very close to bus stop 28, easy to get to Heraklion, airport and other cities. AC works good and free of charge. Kitchen is fully equipped with dishes, glasses, etc. Fruit and vegetables store is also close. Wonderful sea and mountain view. We love Crete and Stalida! The hosts Stella and George were excellent. They looked after us from start to end of holiday and gave us little treats like homemade Raki and cakes and biscuits etc. The location was good, only 5 minutes walk to the centre of Stalis although you had to be careful crossing a busy main road. Stalis has plenty of nice Greek family restaurants and loads of pleasant bars to have a drink (or two!). We would definitely return to the Castello Apartments the next time we visit Stalis. George and Mama who own the apartments are wonderful. They are very friendly and welcoming. They made us feel very at home. Thank you both. Close to the beach. Free parking for a car. Lots of restaurants and shops nearby. It is typical tourist village with hotels. Excellent location. Was a 4 minute walk to the beach, bars and restaurants and there’s a bus stop 150 yards away to all the main attractions and airport. Stella and George were very friendly and helpful and welcomed us with fresh juice, grapes and homemade biscuits. 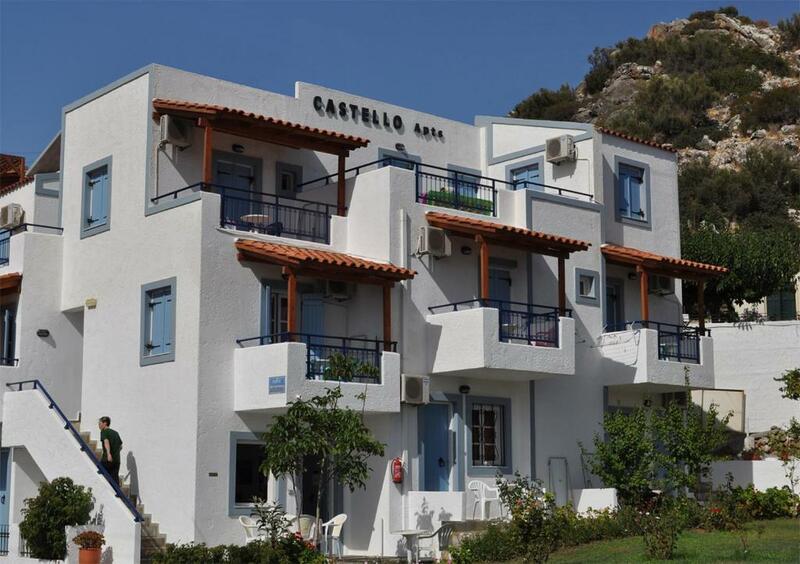 Lock in a great price for Castello Apartments – rated 8.6 by recent guests! 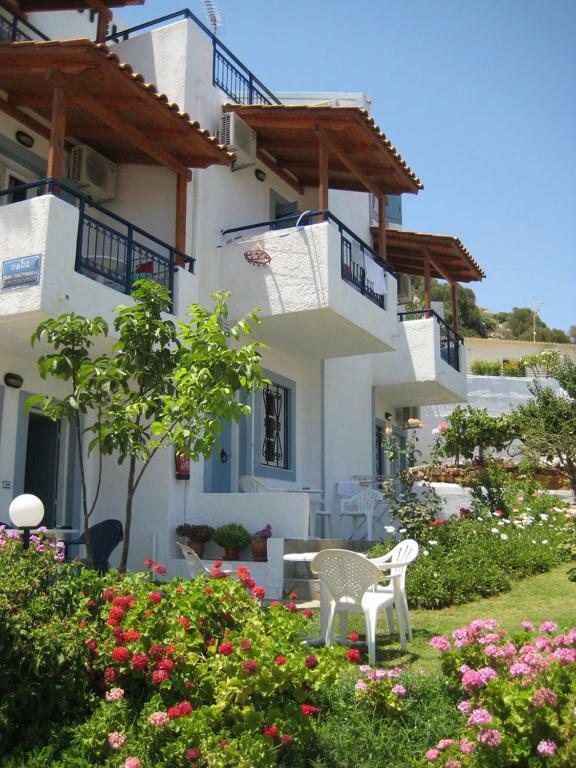 One of our top picks in Stalís.Located in the seaside town of Stalida, 500 feet from the beach, Castello Apartments offer self-catering accommodations with free Wi-Fi. Within 328 feet, guests can find restaurants, bars and cafes. 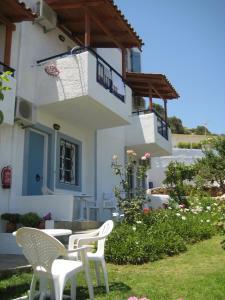 All air-conditioned studios and apartments at Castello are simply furnished and have a balcony. Each comes with a kitchenette and a private bathroom with shower. Free sun beds and umbrellas can be found at the hotel’s garden. 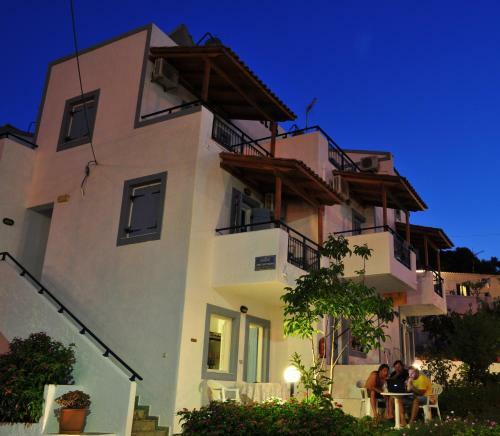 Guests are also free to use the swimming pool of Filia Hotel, located 50 feet away. 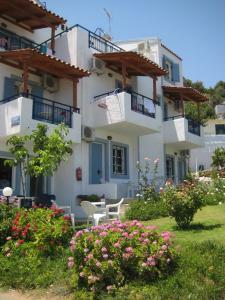 The busy towns of Malia and Hersonissos are both 1.2 mi away from Castello. Heraklion International Airport is at 20 mi. On-site parking is available free of charge. 뀐 Located in the top-rated area in Stalís, this property has an excellent location score of 8.2! 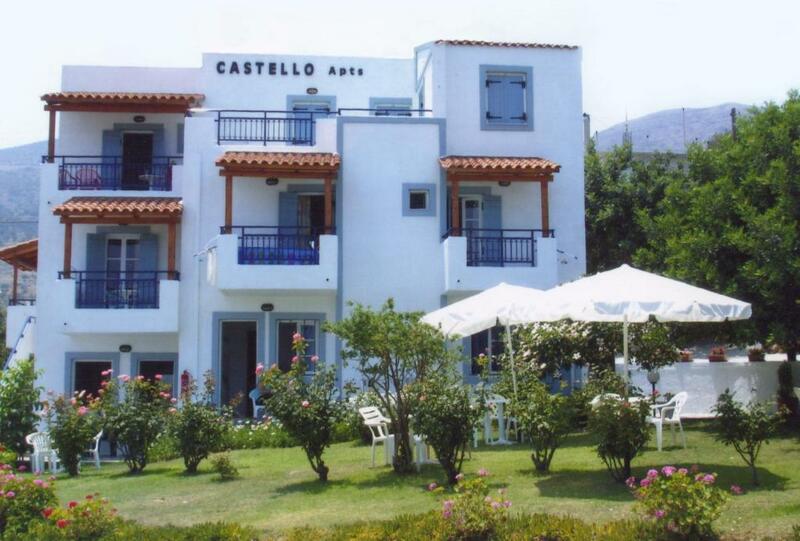 When would you like to stay at Castello Apartments? 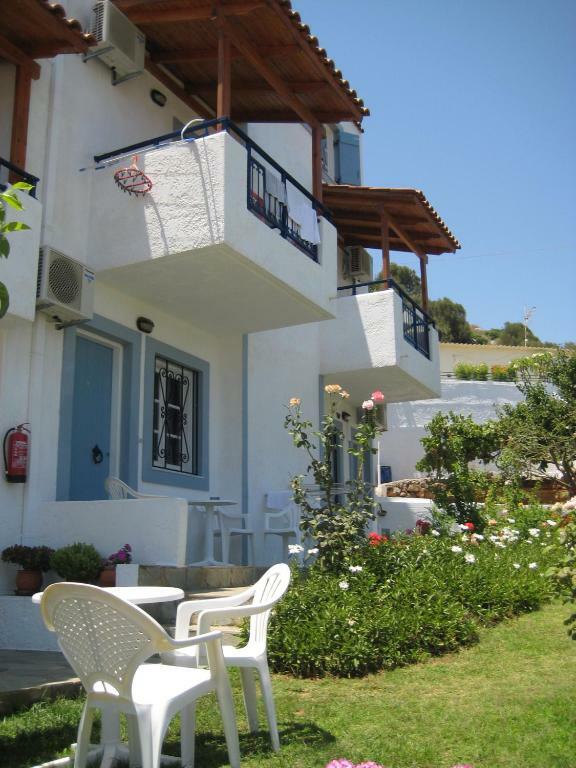 Featuring a balcony, the studio offers air conditioning, kitchenette and fridge. Studio sizes may vary. Please note that a baby cot is provided upon request and upon confirmation by the property. This spacious and air-conditioned apartment consists of a separate bedroom and an open-plan seating area with a kitchenette. Wi-Fi is included. House Rules Castello Apartments takes special requests – add in the next step! Castello Apartments accepts these cards and reserves the right to temporarily hold an amount prior to arrival. Please note that you can communicate via phone with the hotel only after 16:00. Email communication is possible throughout the day. At the beginning I did not like the rooster crowing in the morning in that area, but after two days you get use to and it seems to be quite funny. If you don't like it, just close the window shutters (it works) so it is not too bad and it gives this place nice character. George and his mum could not have done more for us. Everything about the description was true to its word. Perfect location for everything. Couldn't fault this place or our experience. Would definitely recommend and absolutely return here again. Thank you George and family! It was really noisy at night, sounds of cars, quads, motorbykes were dusturbing for little baby, but it is not a big problem for adults. Kitchen could be equipped better. Room could have be cleaned more often. The owners were so lovely! As with most Greek showers, the cubicle was very small and there was no hook for the shower head which made showering a little tricky sometimes. Situated on very busy road, which was hard to cross and very noisy at night. Shower doesn’t attach to wall and wifi very poor signal. We had two lovely apartments next door to each other. Cleaned every other day with fresh towels and fab cake from Stella. Free air con which was great. Mother and Son who run apartments are really welcoming and friendly. George & Stella were wonderful hosts. Their hospitality excelled anything we have experienced before. The room was as described and the location was ideal. The shower was tiny and the sink didn't work properly, but it wasn't a big problem for us. Castello Apartments is a nice place to stay! The hosts (George and Stella) are really friendly. They are always ready to help you! Apartments are close to the bus stop 28 and are not far from great Stalis Beach. In our room we had the balcony with sea view. Cleaning of the room — once in two days. In addition we were able to use the pool in Filia Hotel across the road for free (you can see it on the photo)!